Almighty God, our heavenly Father, who makes it possible for us to work and gives every creature its food, declaring your glory and showing your handiwork in the heavens and in the earth; Deliver me, I pray, in my work, from coveting material goods, from falling into the temptation of serving mammon and putting money in the forefront of my life. Help me to perform faithfully the work which you have put at my hand, in truth and in righteousness, with singleness of heart as your servant, and to the benefit of my fellow man as well as myself; for the sake of your Son, Jesus Christ our Lord, who lived and died only to serve us. Around the time Jesus had returned to Nazareth, Herod the tetrarch heard about his works, and said to his servants, "This must be John the Baptist, who has risen from the dead and has thus gained mighty powers." Herod had seized John and put him in prison, because he desired a woman named Herodias, who was married to his brother Philip. John had stated in public that is was immoral and unlawful for Herod to have her. But the people believed John was a prophet, so Herod was afraid to kill him. At Herod's birthday celebration, the daughter of Herodias danced for him and his guests. She pleased Herod so much, that he swore to give her whatever she wanted. 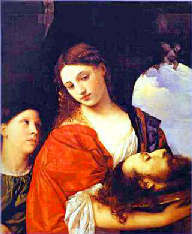 She had been instructed by her mother, and said: "Bring me the head of John the Baptist on a platter." Herod was unhappy, but had to keep his word before his guests. So he had John beheaded in the prison straightaway. John's head was brought on a platter, and given to the girl, who presented it to her mother. Afterwards, John's disciples came, and took up the corpse, and buried him; and they went and told Jesus. This colorful, gruesome tale, with the chilling line "Bring me the head of John the Baptist on a platter", has been a favorite of painters, authors and composers for 2000 years. Perhaps the best-known work is the opera "Salome" by Richard Strauss. The Bible does not give the name of Herodias' daughter, but modern scholars almost unanimously agree that her name was Salome. There were a number of Herods during the Roman occupation of Judea, with a tangled history of marriage, kinship, and titles. Two of them are prominent in the Bible: Herod the Great was the ruler of all Judea when Christ was born; he was the one who ordered the slaughter of Hebrew children and caused Joseph and Mary to flee to Egypt. The Herod in this passage is Herod Antipas, one of Herod the Great's sons. Herod Antipas was later involved in Christ's crucifixion. He is called a "tetrach", meaning "ruler of one quarter", because Herod the Great had divided his kingdom among his sons.